“Everything is 10 minutes away,” tour guide Andrew McCarthy says of his home of St. John’s as he drives our group into town from the airport. He means by car, but his statement almost applies to walking as well; even iconic fishing village Quidi Vidi is just half an hour by foot from our hotel. Ask McCarthy why he returned to rejoin the family business in Newfoundland and Labrador after two decades on the West Coast and his answer is the conversation – and the people. “We take time to talk, to engage,” he says. After just a few hours in town, I can see what he means. So while all these destinations are at most a 10-minute walk apart, be sure to leave a buffer for a stop and a chat. It’s all part of the local experience. 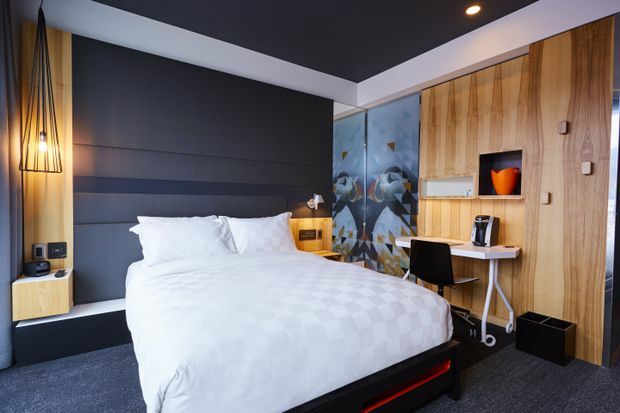 Rooms at the Alt Hotel feature both clever and practical design features such as a bedside table that doubles as an on-bed laptop desk or breakfast stand. 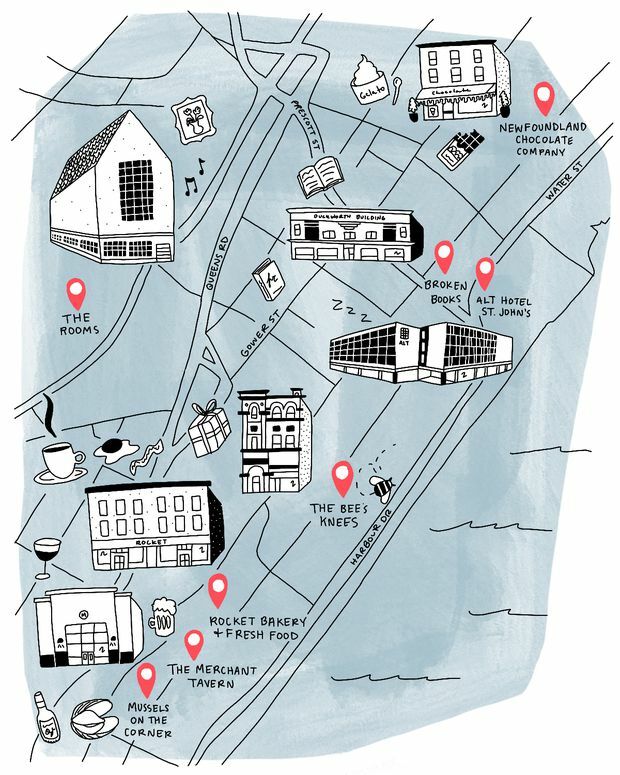 Perched on a prime harbourside location on downtown Water Street, the Alt Hotel St. John’s is the eighth iteration of Quebec-based Group Germain Hotels’ “affordable chic” brand. Opened in November, the 148-room property blends the signature colourful, modern Alt style with regional touches – think puffin-adorned glass walls to let light into the showers and a mural in the lobby showcasing a patchwork of images by local photographer Michael Winsor. Rooms feature both clever and practical design features such as a bedside table that doubles as an on-bed laptop desk or breakfast stand and bedside controls letting you adjust curtains and lights while your head’s still on the pillow. Behind the scenes, an ocean-powered geothermal heating and cooling system is just one of many eco-friendly touches. Coming later this year: an on-site restaurant managed by an as-yet-unnamed local restaurateur. Book a room overlooking the water for views of the Narrows and harbour traffic – or enjoy the same from the outdoor patio or even the treadmill. From $154. Fun fact: Newfoundland Blue Mussels were the first in North America to be certified organic. More fun fact: proprietors Brenda O’Reilly and Craig Flynn of Mussels on the Corner held out for a corner location for this shellfish-themed spot (in one of the oldest buildings in town) so they could name it after Newfoundland folk song Mussels in the Corner. Drop in to sample mussel tacos, pickled mussels, steamed mussels or dried mussels as well as regional dishes such as toutons with molasses, seal poutine and moose bolognese spaghetti as you admire the collection of spoons hanging on a Newfoundland-shaped wooden wall rack, a hand-me-down from Flynn’s grandmother. The more casual sister to acclaimed upscale Raymonds, the Merchant Tavern serves lunch, dinner and weekend brunch from its wide-open, high-ceilinged dining room in a former bank building. The bar is a centrepiece both physically and for the palate: the trendy-but-not-too-trendy drinks menu covers everything from seasonal drafts by Quidi Vidi Brewery to Nova Scotia sparkling wine and cocktails made with Iceberg Vodka and wild-foraged Dark Tickle bakeapple tea. Dinner highlights include the seasonal Farm Salad and the vegetarian Cauliflower Steak, served with a white bean and lentil cassolette. You also won’t regret ordering one of the fresh pastas on offer, nor the restaurant’s take on traditional dessert vinegar pie. A homey spot with retro vibes, Rocket Bakery serves its sandwiches, salads, baked goods and beverages seven days a week, but you’ll want to drop by on a Tuesday at 12:30 p.m. for the weekly kitchen party, when a circle of musicians breaks out in foot-tapping tunes. Take the scene in with a cup of coffee from one of three Canadian roasters and a slice of Rocket’s famed bread pudding, then shop for souvenirs such as vintage-style posters, handknit dishcloths or tea towels screen-printed with local motifs. A view of St. John's from Signal Hill National Historic Site. Eco-friendly, ethical and local are the keywords at eclectic boutique The Bee’s Knees. Shop here for puffin-adorned postcards, rug hooking and knitting kits, East Coast Glow beauty products and regional food items such as honey, salt and cocktail syrups and shrubs. One highlight: doormats and dog toys made from upcycled old fishing rope. Perhaps the best way to take a bit of a place home with you is via the written word. Whether your tastes lean to fiction or non, something is sure to pique your interest at new and used bookstore Broken Books, where you might find cookbook Rock Recipes Christmas shelved next to Julia Child, and short stories by local writers Eva Crocker and Gerard Collins beside an illustrated Chekhov collection. 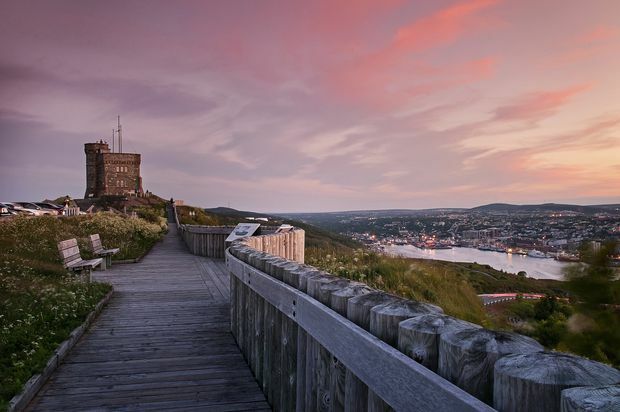 A museum, art gallery and archives, the Rooms is the province’s largest public cultural space, aimed at showcasing Newfoundland and Labrador “to itself and the world.” Permanent installations include multiple perspectives on the various cultures – both Indigenous and settler – who have made this land their home. This summer and fall, see the Fever, a tarot card-themed exhibit by St. John’s native Rhonda Pelley that asks visitors to consider how the past informs the future. Leave time for a meal at the Rooms Café, where the menu manages to cater to modern dietary preferences while doing justice to local traditions like chowder, cod tongues and cod cakes. The writer travelled with support from Newfoundland and Labrador Tourism and Le Germain Hotels. Neither reviewed or approved this article.